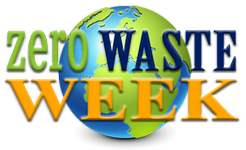 There are just two weeks before the eleventh Zero Waste Week campaign begins. You know what that means? It’s time to get prepared! Without knowing what you’re starting with, you’re unlikely to succeed in your Zero Waste Week pledge. Think about it – if you were on a weight loss plan, the first thing you’d do is hop on the scales and take your measurements. Once you know what you’re dealing with, you can make a plan. Measuring your waist is no different to measuring your waste my friends! If you don’t know what you’re throwing away, how can you reduce it? Now, between you and me, we’re focusing on reducing single-use plastics this year. So for a week, I want you to live your normal life and jot down every piece of single-use plastic you put in the bin or discard when out and about. You might be surprised to see how much you use. I kept a sheet for a day and ended up with a cat food pouch, food packaging and other items I’d not really thought about before. For each item ask yourself WHY you’re throwing something away, note where it’s going and start to think how you could improve this during Zero Waster Week. You might realise you’re doing a lot of things through habit and a small tweak can make all the difference. It might mean you need to say no to a disposable bag or straw when out and about. It might be time to have a word with your local store and see what their plans are for reducing single-use plastics. Last year, Waste Warrior Simon created a downloadable pdf for you to do your very own waste audit. And the lovely man has delivered again! Simon runs Magic Oxygen Publishing with his wife, Tracy. Magic Oxygen Publishing was founded with solid green ethics and is powered by creativity, optimism and sustainability. Staff and visitors are fuelled by organic, Fairtrade food and drinks, the office is powered by renewable energy, they drive an electric car and that they plant trees for every new book published. They’ve also funded the building of a much needed new classroom in Kenya. Download your pdf resource and start auditing your waste today!